There are several things I enjoy about participating in French Fridays with Dorie. One is that I’m cooking more recipes from a single cookbook than I’ve ever done before. Every week for over six months (well, OK, I skipped once), I’ve tried a new recipe from Dorie Greenspan’s Around My French Table. The recipes are so varied: different courses, different ingredients, and different levels of complexity. I’ve learned new ways to make old favorites, been introduced to some new combinations, and definitely learned some new techniques. Sometimes, I make the recipe straight from the book. Other times, I vary it because of food preferences or lack of shopping preparedness. I’m doing this along a community of other food bloggers that share this experience each week. My favorite part is reading the other blogs and getting new ideas and inspirations based on others’ variations or lessons learned from the same recipe from the same book. The bloggers are from all over the world, and each one brings something different to their kitchen. What’s your favorite part of being part of FFWD? 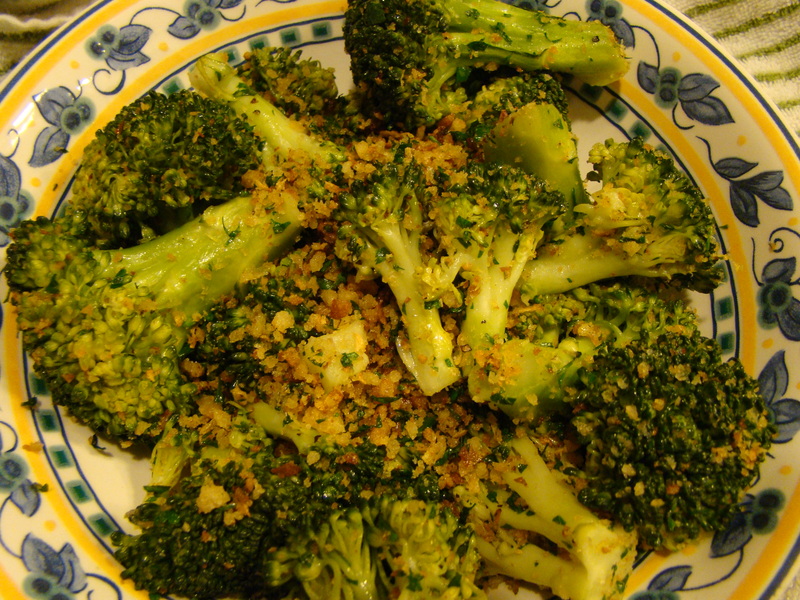 This week’s recipe was another easy one: Garlicky Crumb-Coated Broccoli. I love most vegetables, but, honestly, broccoli is one that I have only recently made peace with. Not to get too political, but I remember in the 1980s when the President George Bush (the first) proclaimed that he had never liked broccoli. It was the only thing he ever said that I actually agreed with. This is all to explain that I wasn’t as horrified as I might have been five years ago to see a broccoli recipe as the week’s choice. There isn’t all that much to say about this recipe. It was a simple, though tasty, side dish. 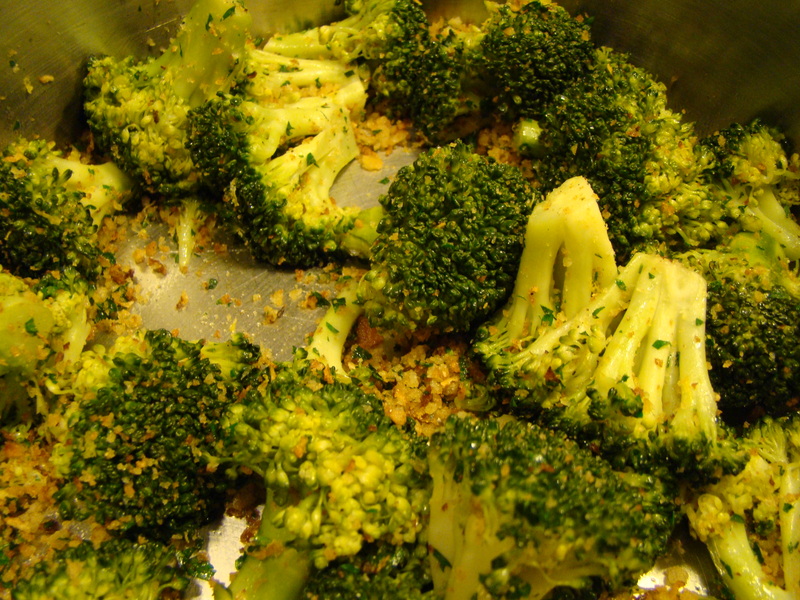 Steamed broccoli tossed with garlicky buttered crumbs with a smidge of lemon zest and fresh parsley, giving it a gremolata undertone. My thoughts on this one? I made half a recipe. Though the recipe said to cut the original quantity, double what I made, into only six pieces. I knew I would prefer eating the cooked broccoli without cutting it from the stalk, so cut the broccoli into smaller florets. This worked out well because there were that many more surfaces for the crumbs to stick to. I steamed the broccoli in a pot as the recipe suggested. Usually, I do it in the microwave. Next time, I’d just do my usual way because it’s easier, faster, and less dishes to wash. I used the zest of half a lemon, but the citrus flavor wasn’t all that strong. I’m not sure whether I would add more zest or just leave it out. 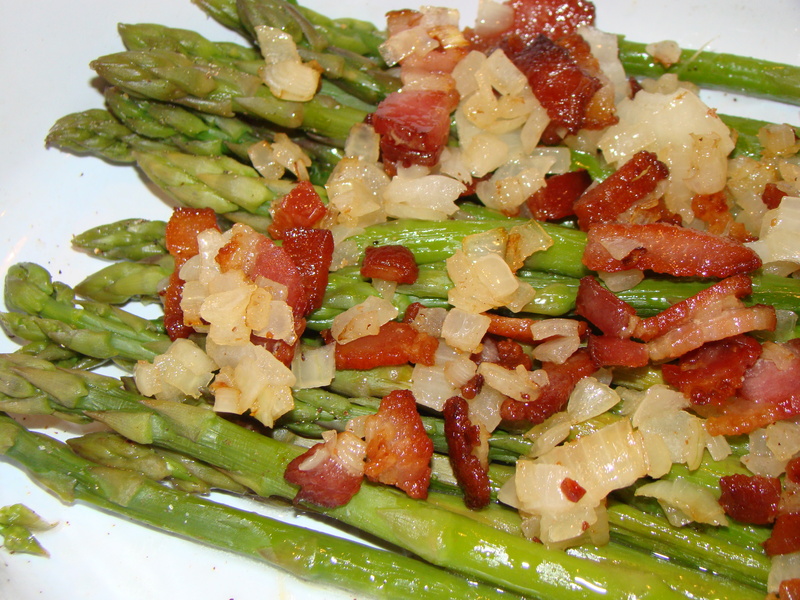 I made the Asparagus with Bits of Bacon (on page 330 of AMFT) in tandem with the broccoli. The asparagus was unplanned, but when I realized I had some, I looked to see what recipes Dorie had for asparagus. I had all the ingredients for this recipe on hand. Both were easy enough to make at the same time, and I’d probably make both again. I’m glad I’ve finally learned to enjoy broccoli. To see how the other FFwD bloggers fared with their broccoli this week, check out their links here. I’m sure there will be some creative twists on this easy recipe. Next week’s recipe is Vanilla Eclairs, which will take me completely out of my comfort zone. I’m a bit nervous, but it will be interesting to try something completely different. Posted on 8 April 2011, in French Fridays with Dorie and tagged broccoli, French Fridays with Dorie. Bookmark the permalink. 18 Comments. Both your dishes look amazing! I’m excited to try the asparagus with bacon. Great post! Glad you have found your way over to the “green side”. Oh, I’m with you on the vanilla eclairs. I’m not worried at all about the pastry cream but just piping out the tubes… What I love the best about FFwD, besides the sense of community, is knowing that I’m learning a lot. I know I’m a decent cook, but now I’m just hungry for more information, more techniques, more ideas like these breadcrumbs. I know I will keep getting better, not just at the food, but the writing and the whole picture taking/editing too. That makes me happy! I am nervous for the vanilla eclairs too. I did my steaming in the microwave…anything to save on washing dishes. I really loved the lemon zest in this recipe. It just added such a wonderful flavor to the broccoli. I make asparagus a lot and yours looks really good. I will have to check that recipe out! Good for you to be willing to get out of your comfort zone and to become friendly with foods that are less easy to enjoy. We adopted 2 older girls from a Russian orphanage…they had survived on some type of cooked cereal…no veges. They had never heard of salads with greens…which they called weeds, and never seen anything like broccoli. They needed to learn to eat more kinds of foods and to use money so I used to pay them to eat broccoli…and now they both love it…it has become a favorite. Reading your post reminded me of those experiences…all good memories. I’m glad you’ve learned to embrace broccoli. It’s such a versatile, nutrient-rich vegetable. I’ll have to try your soup recipe – cheese and broccoli are two of my partner’s favourite foods. I think FFwD is providing us all with a lot of potential for growth and community. I’m loving it so far. So nice to get a bonus review for the asparagus! Bring on the eclairs (I have a bit of trepidation myself!!!). find the recipes that challenge me to be the most fun. i love learning to cook french food. and also learning that french cooking is NOT that scary, after all. thanks for posting! I’ve met so many people through FFwD and made dishes I never would have made – those are my favorite parts of being involved with the group. It sounds like you like broccoli lots of ways. Roasted is one of my favorite ways to eat broccoli too. I’m enjoying FFwD for the same reasons as you…I don’t think I’ve ever made a recipe from the same cookbook for so many weeks in a row before! can’t go wrong with bacon!